The following tutorial was inspired by THIS video, which I reccommend watching before you read this, just to make things a little simpler. Anyway. While I thought it was better than most (and it had the actual hairstylist from The Hunger Games movie!) I still didn't think it looked exactly right. AND I don't know how many people have money to go out and buy that fancy hair kit. I know I don't! 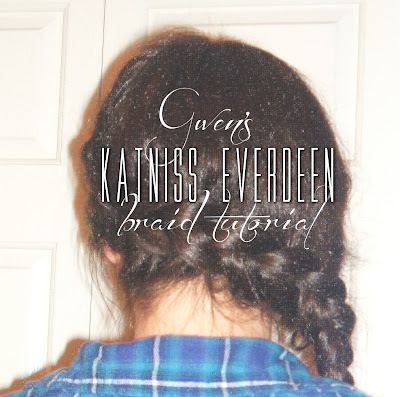 So, (to sound horribly cliche) without further ado, I present my very own tutorial on how to braid your hair like Katniss! Step One: Turn your curling iron on. Part your hair on the right side, using the comb. This was a bit weird for me, since I have a natural left part, but after some combing and pinning (just to press my bangs into submission), I made it work! Pick up your curling iron, and wrap the twisted piece of hair around the barrel, holding it there for eight to ten seconds. Let go. Repeat several times, twisting and curling pieces all around the top of your head. Yes. Yes it looks weird. Hang on. Step Three: Gently finger-comb the twisty-curlies. I did it a bit too hard the first time, so they got horribly tangled at the ends. Actually, I'd say that you're better off separating them into two or three different pieces, instead of finger combing. Still looks strange, yes I know. Step Four: Take a medium-big-ish sized piece of hair from the left side of your head, and separate it into three equal pieces. 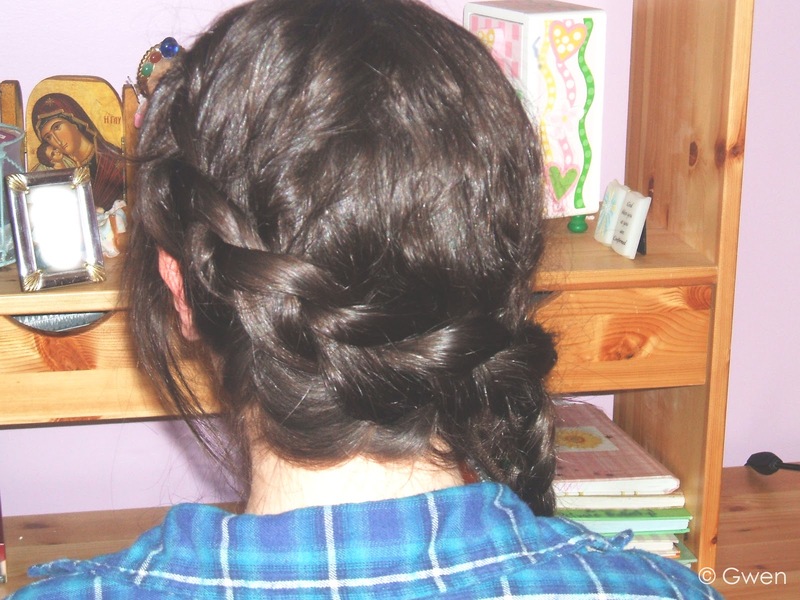 Start dutch braiding; cross the pieces under each-other, picking up new pieces of hair as you go along. Step Five: As you go along, instead of making the braid travel diagonally across your head like most tutorials show, wind down past your ear and around your head. Step Six: Keep braiding until the braid reaches the right side of your head, and you start running out of hair. Once all the hair has been gathered up, finish off the braid normally, only remember to keep crossing the pieces underneath one another. Step Seven: Tie the end with an elastic, and pin back any big twistys that are sticking out. Katniss didn't wear hairpins, but I had a few huge bits of hair sticking out all over the place. Just make sure to tuck the pins under your hair, so they can't be seen. I could probably take requests too, if the style is simple enough. I'm thinking about doing Clove's Training Center hair, or Prim's Reaping hair. This is lovely! Your hair is dark, and therefore looks more like Katniss' than my light brown locks. I would love more tutorials! Thank you dear! I like to wear it, it's easy and fun to do, but sometimes I feel a bit self conscious going out in public, if you get what I mean. I say you alert the head hairstylist and give her a piece of your mind. I was actually just thinking on how I really liked they did it, and my hair NEVER works when I braid it over to the side...everything on the left side ALWAYS falls out. Have you tried maybe spraying a bit of hairspray on the left side? Wonderful hair tutorial! I love braids, and I am happy to try anything from the Hunger Games! I have one question though. Would the curling iron be necessary to do the curling iron? So far as I can see the curling iron it just adding body. 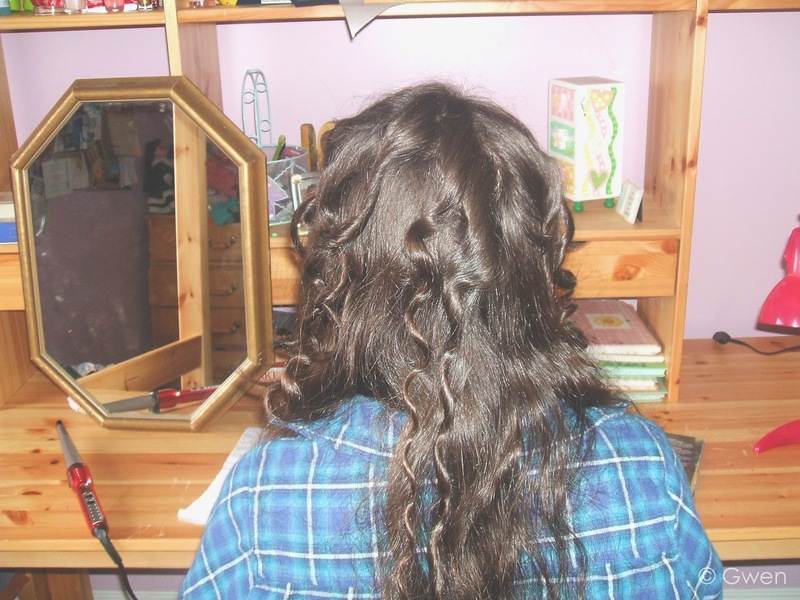 I don't like the curling iron that we have, so if there is any way to do it without it I will be very happy. :) I also could not help but admir you bookshelf. :) You have lovely hair! I'm glad you liked it! Ooooh. Did you take pictures? CUZ I WANNA SEE. Woah.. Your bookcase looks exactly like mine :) Even the order of books. Except you don't seem to have Inkdeath, and I don't have have the books that you have that are before the Inkheart trilogy on the shelf.